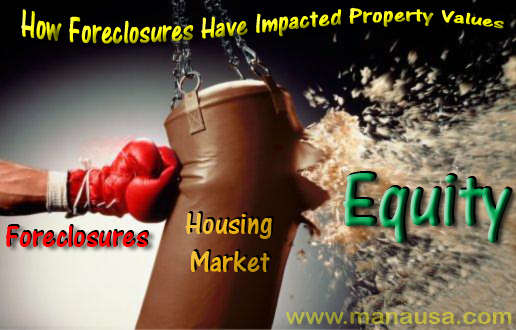 Do you want to know how foreclosures have impacted property values? 1991-2006: "In regards to how foreclosures have impacted property values ... they haven't! Foreclosures represent a minority of our home sales, less than 2 percent, so we just ignore them when we determine the value of a property." 2007-2009: "In regards to how foreclosures have impacted property values ... they are a different type of home sale. They shouldn't be used to determine the value of your home, you just need to know that they represent nearly 20% of the market (including pre-foreclosures, short sales, bank owned properties, etc.) and will distract some of the home buyers out there." 2010-2012: "In regards to how foreclosures have impacted property values ... they are definitely impacting home values. As much as 40% of the market is distressed property sales, so the market is split. Buyers who have time and a willingness to do some clean-up are considering both sides of the market split." Beyond 2012: "In regards to how foreclosures have impacted property values ... they dominate the market. More than half of all homes for sale in Tallahassee is a foreclosure, short sale or some type of distressed property. A non-distressed home might sell for 5 %to 10% more due to a better control on closing dates and the property must be in ready to move-in condition." The real estate graph below shows the breakdown of homes for sale in Tallahassee. 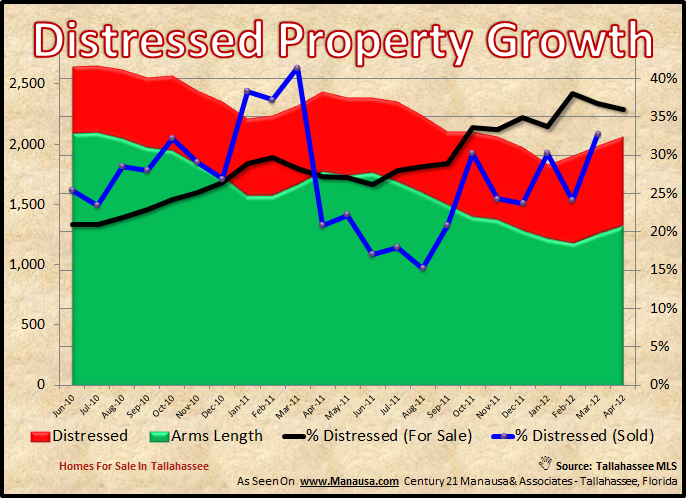 The green area shows the number of arms length homes for sale (each month going back to June 2010), while the red area shows the number of distressed properties for sale in Tallahassee. If you are thinking about selling your home, just drop me a note and we can review your options. We can show you how foreclosures have impacted property values in your neighborhood, so you must decide whether to sell immediately or wait for the wave of foreclosures to push through the market.